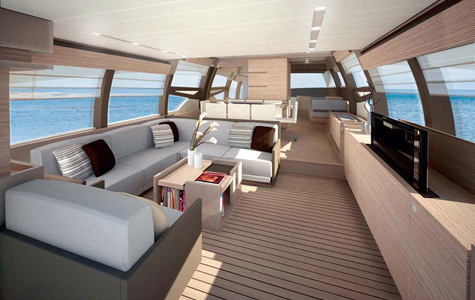 HomeNot all work, rest and play or is it with the new Ferretti 720? 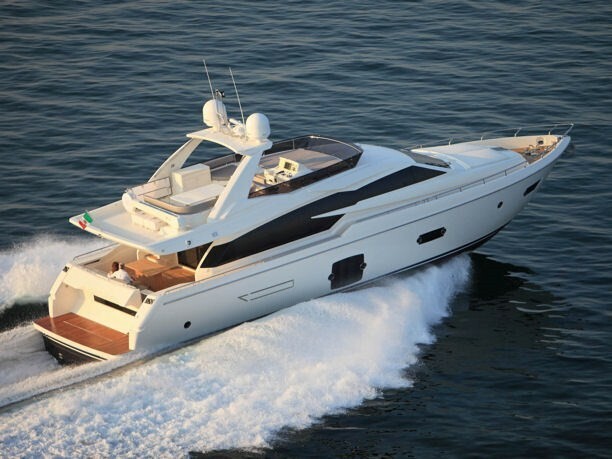 Not all work, rest and play or is it with the new Ferretti 720? 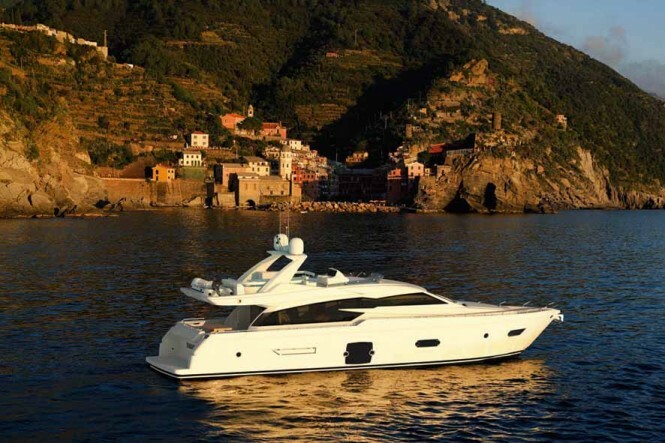 Ferretti Yachts, one of the icons of Italian-made luxury and a historical Ferretti Group brand presents the world premiere of the Ferretti 720 in the town of Rapallo. The Ferretti 720 develops the Ferretti Yachts range with a model that harmoniously combines Ferretti DNA with revolutionary features, both in her lines and the design of space. “I’m particularly proud to see a new model of the Ferretti Yachts range in the water”, commented Norberto Ferretti, Ferretti Group Chairman and Founder. “For over 43 years, Ferretti Yachts has pursued its aim of realising our Clients’ dreams, and I’m sure we’ll make many Owners happy with the Ferretti 720!”. “This time too,” continued Norberto Ferretti “our team, formed of the Group’s AYT, Centro Stile Ferrettigroup and the fundamental contribution of our friend Gianni Zuccon, has created a real winner model, which fully represents our core values”. 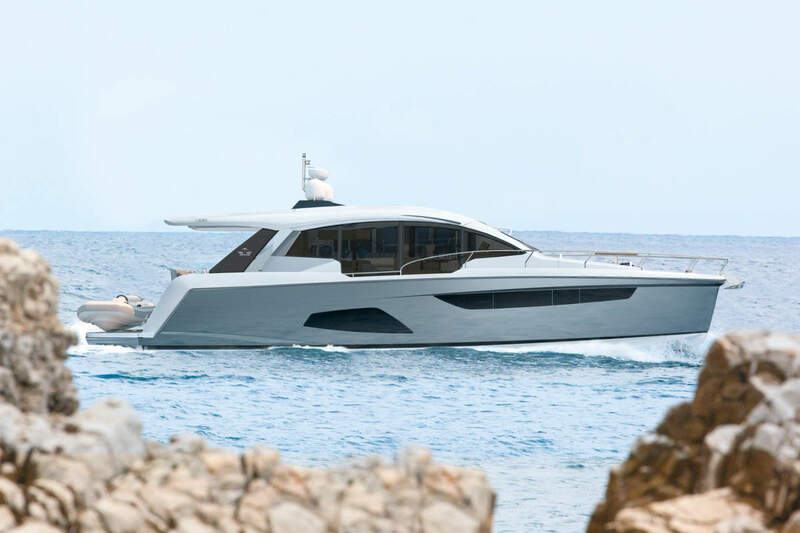 “The new project originates from the innovative concept of which Ferretti 800 was the first example,” commented Alessandro Tirelli, Ferretti Yachts Brand Manager “or better, the ability to create a balance between the classical-contemporary style of Ferretti Yachts and a modern taste for interiors, combined with a high impact exterior design. All this, without forgetting undisputable values such as quality, functionality of space, comfort and performance which the Ferretti Group never ever compromises”. “The project developed through our ability to further satisfy our Clients’ demands, even the younger, international ones,” continued Tirelli, “who like the characteristics of Ferretti Yachts models, but are attracted by increasingly more sporty, racy lines, too. We have high expectations for the Ferretti 720” he concludes, “and are sure she will be popular both with Owners who wish to ‘mature’ – as it were – in the Ferretti Yachts range, and new Clients, particularly in Italy, the ‘extended’ Mediterranean Europe (including Turkey), the Middle-East and North America”. The new Ferretti 720 features a winning, sporty exterior line, a new concept roll bar with an integrated bimini top, and continuous glazing running right along the main deck, characterised by an innovative design which makes this yacht particularly sporty. Large windows positioned so they light up the guest and VIP cabins at bow have been added to the open views fitted in the hull. The cockpit is a true outdoor salon, with teak flooring, and a large table with a bench and seating for 8-10 guests. The flying bridge is reached using the stairs set on the left, where a large dining area with U-shaped table is located, as well as a grill area and fridge. 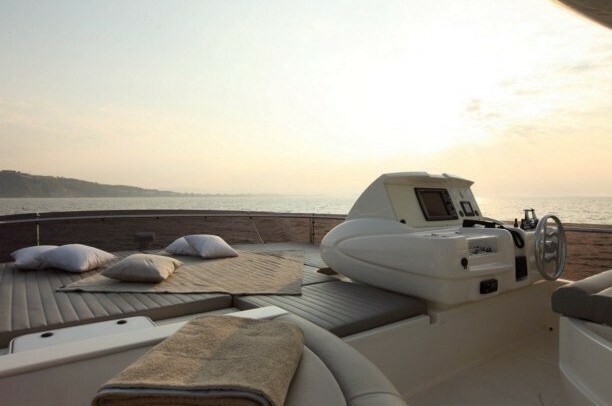 The davit enables Owners’ to house the tender for which a special space has been reserved on the flybridge, whilst a jet ski can be housed on the stern spoiler. The raised external steering position guarantees excellent visibility and is located starboard at bow along with another large sundeck. 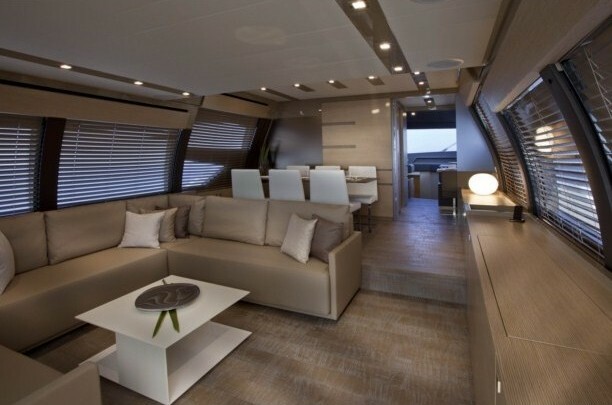 Inside, the Ferretti 720, which measures almost 22 metres in length and almost 6 in width, features generous spaces, further enlarged by the natural light which filters in through her large windows. Excellent liveability characterises the large salon which uses the width of the hull to offer an environment typical of yachts measuring well over 70’. The interior of the salon has been organized into living and dining areas. The living area features an L-shaped sofa, ecru coloured, two seater divan and white Corian coffee table, the Martì model produced by Poliform. A dining area is located towards the bow, with a large custom-made crystal table produced by Cantori, which features a central base and an Omnidecor crystal glass top with satinised bronze-finish top. The lunch area is completed with Martha G model seats produced by O&G-Gruppo Calligaris, featuring a steel structure. Materials with a contemporary taste, such as lacquered elements alternated with leather and grey oak wood blend together to make this area warm, refined and welcoming. Full and empty spaces alternate elegantly, resulting in a well-balanced, lightweight appearance, and the low pieces of furniture are highly functional, whilst still allowing ample room for the windows. 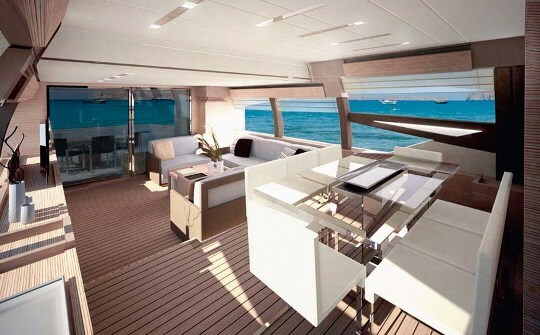 Spatiality is intensified by the natural light, adding to the pleasure of being on board. The salon wall towards bow alternates a number of different materials: wood in the centre, a decoration created by a satinised bronzed mirror, and it is also possible to fit a sliding door to separate this area from the others on the main deck upon the Owner’s request. Continuing along, an access area leads to the galley and helm station. 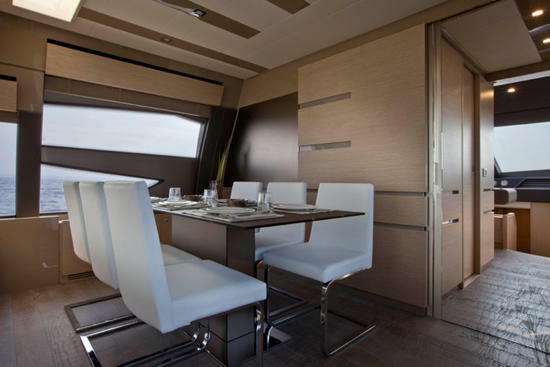 A spacious, lacquered white, fully-equipped galley with Corian work top is located to the left, and communicates with the helm station by means of a sliding door. There is a comfortable dinette with two small sofas opposite the galley, which can also be used as a charting area, in direct communication with the helm station. The steering position is located portside and enjoys excellent visibility thanks to continuous side and bow glazing. 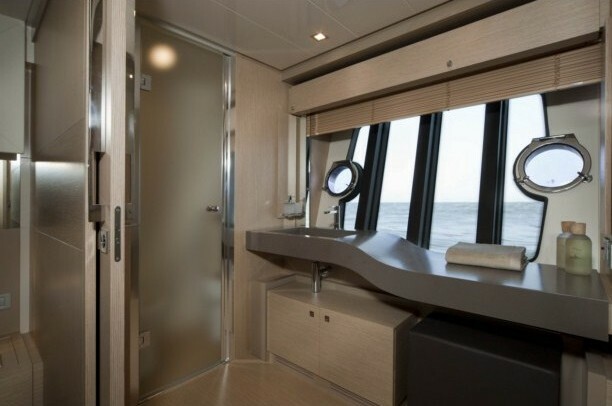 On the left, a door opens onto the exterior, so the crew can access the galley-pilot area without having to walk through the salon guaranteeing maximum privacy to guests. The stairs for accessing the area below deck are located on the right. 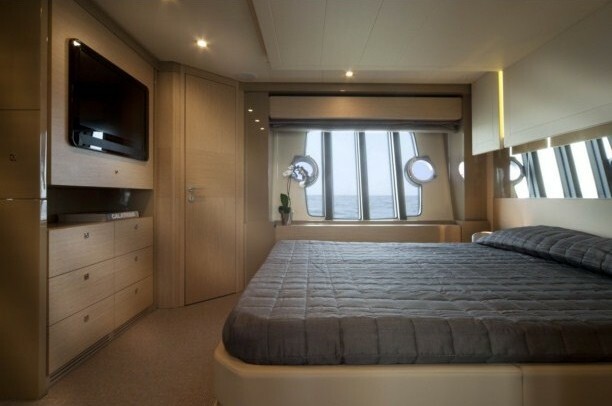 The night area features space and height which are to the full advantage of the comfort and liveability of the guests on board. 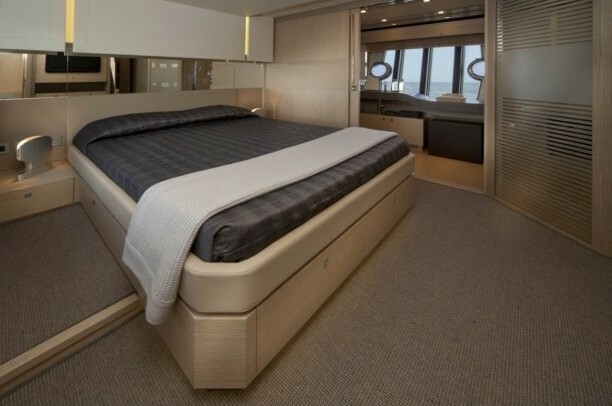 The master suite is located full beam in the centre of the yacht. Lit by means of large open view windows, it has been fitted with low furniture, and the bed is oriented in the cruising direction. The large head to the left uses the entire length of the cabin, and is accessed through a sliding door. It houses a leading feature of this area: a large shower with crystal walls. A spacious walk-in closet unit with a built-in TV completes the furnishings. 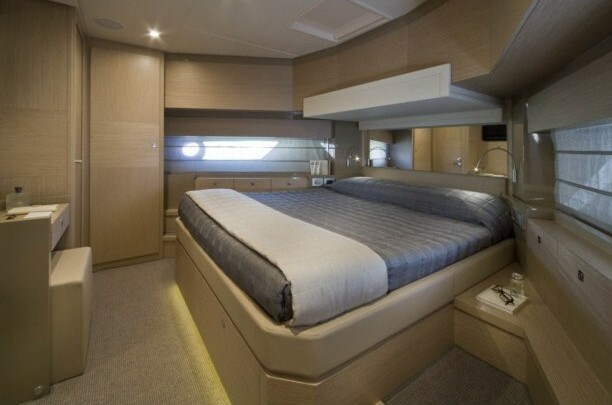 The wealth of materials and the natural shades mark the various different areas of the master cabin, too, featuring lacquered details alternated with wall panelling and decorative features applied to the bed run-around and head board in which a mirror has also been fitted. Two satinised silver Twins model Pentalight wall lights complete the refined atmosphere of this environment. Two comfortable, twin-bedded cabins are located towards the bow, both with en-suite heads and large shower, as is the VIP cabin, completely at bow, which is also equipped with a large head and separate shower. A system of sliding beds on tracks can also be created in the portside guest cabin or, alternatively a queen size bed. Ferretti Yachts pays great attention to the crew, as well. The crew area, accessed using the stairs located to the left of the cockpit, is completely separate from the Owner/guest area and located astern on the lower deck. A utility room equipped as a laundry area allows for direct access to the engine room, the two cabins and the head. Even the materials converge to create the atmosphere, through the coherence of language between the different areas of the yacht. “Grey” oak was chosen for all the furniture, in a lighter shade than the wood itself, in order to create a refined, modern scenario in which the style details mark the different areas. Natural colours express themselves in the widespread use of “brown-grey” lacquering for all the details: the structures for the furniture, the window frames, the wall panelling, the fabrics for the sofa and the crystal for the table and sliding wall, the latter of which isolates the salon from the bow area. 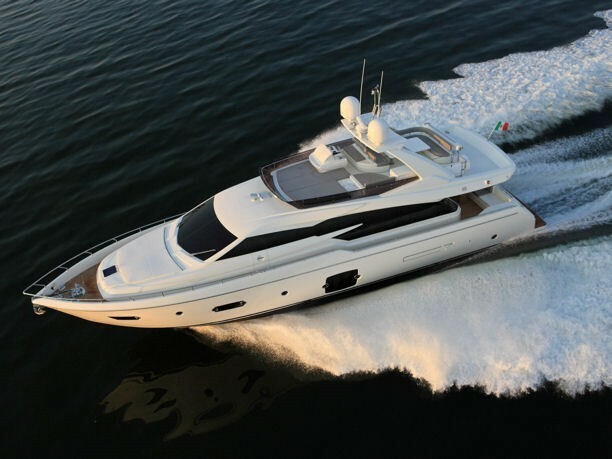 The Ferretti 720 stands out for her ease of handling thanks to the innovative system ZF SteerCommand for Ferretti, developed by ZF Marine, a leading company in the production of marine propulsion systems, in close collaboration with the Ferretti Group. 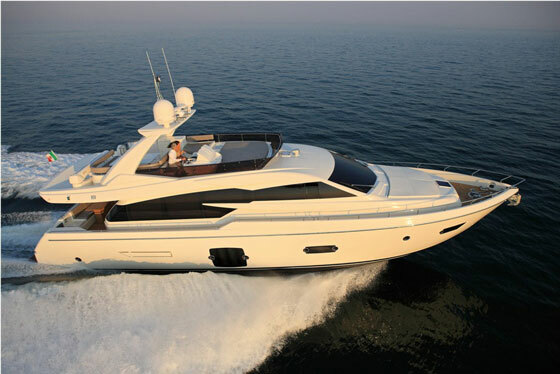 This system, supplied as standard on the new model Ferretti 720, features independent steering and differentiated variable assistance turning which makes it possible to half the turning diameter and control reactivity, leading to a runabout experience which was previously unthinkable on a 72 footer, whilst still guaranteeing the very highest levels of handling, control and safety at any speed. Ease of steering is completed through ZF’s innovative Joystick Manoeuvring System (JMS), which can be fitted on request. The JMS electronically controls engines, inverters and bow thrusters. 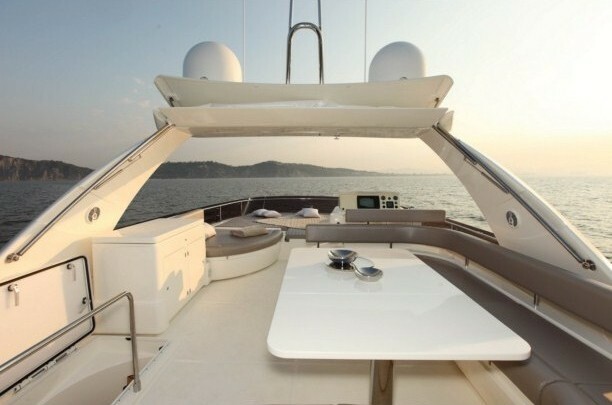 An electronic control system makes it possible to move the yacht in any direction using the joystick. Approaching a wharf, 360° rotation on the spot and other manoeuvres which are complicated with the traditional control levers, become simple operations because the JMS electronic system divides the acceleration of the engines and enables gentle insertion of the transmissions. Thanks to the ZF Joystick Manoeuvring System (JMS), even on yachts with direct shaft line engines there is an automated system for facilitating manoeuvres in craft of all sizes. 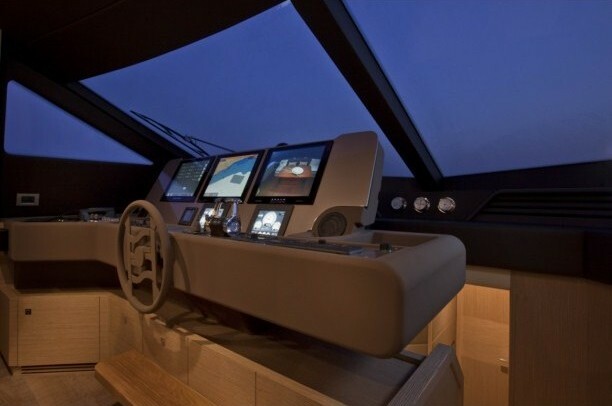 The system is, in fact, equipped with a control unit which reveals the effective direction of the bow of the yacht, comparing it with the direction requested by the captain who is using the joystick. The action of the engines and directional propellers are applied in the best way possible for each and every manoeuvre. 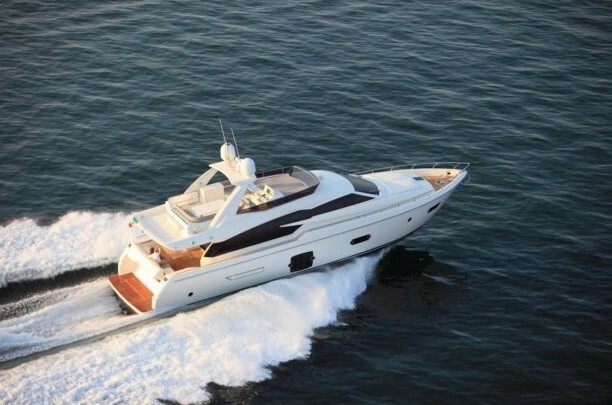 Ferretti 720 is fitted with twin 1381hp MTU 10V 2000 M 92 engines or, as optional 1524hp MTU 10V 2000 M 93 engine. With the larger engine, the yacht can reach a top speed of 33.5 knots and a cruise speed of 30 (preliminary data). The Ferretti 720 ticks many of the boxes for the perfect Sports Yacht, it has style, elegance, innovation and performance but so does many of the competition so what sets it apart from the others well it could be said it has that Italian persona called soul and passion whatever it is the 720 will have you at hello.